This is the classic Iyengar text for all serious students of yoga. 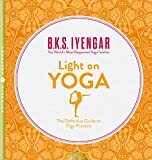 With a step by step photo-guide to routines for beginners as well as a guide to yoga breathing, an introduction to the philosophy behind Yoga and a useful guide to healing specific health problems. This is the first book to relate the impact of trauma on the body and mind to the phenomenon of somatic memory. The book illuminates the value of understanding the psychophysiology of trauma for both therapists and their clients. Written in a fairly clear and concise way, it progresses from relevant and clearly set out theory through to applicable practice. Although primarily aimed at therapists, this book is a useful tool for psychotherapy students and interested general readers who wish to extend there knowledge and understanding. Bikram Choudhury's guide to correct posture and alignment, the book contains and explains exactly how each posture should feel as both ideal as a reality. The book is easy to follow and an insirational guide to Bikram Yoga. This is an excellent book and DVD which provides lots of information about Tai Chi and the benefits of tai chi practice, not only does he go in to the history of Tai chi and and QiGong but also the the major styles, but also presents a good illustrated instruction manual for traditional tai chi and qi gong. This book shows you how to apply a healthy holistic approach to life so that you will enjoy your elder years and be free of prescribed medications and chronic illness. Multiple Assessment tools help you identify strengths and weaknesses in your lifestyle and interventions in the areas of health (physical, mental, and spiritual) relationships, the environment, and politics facilitate success in holistic aging. This comprehensive Text is for the Student and Professional Shiatsu practitioner. It is both clear and accessible with detailed guidance on five phase diagnosis and treatment with both traditional Chinese medicine and five element theory. The book has illustrations and photographs which add to its use as a step by step guide. This book is often used as a main Shiatsu reference. A good book for those interested in Transactional Analysis as a way of changing life patterns. An ideal read for students and psychotherapy practitioners alike. Clinical psychologist Claude Steiner looks at ways of changing our scripts in order to achieve the happiness and fulfilment we desire, with practical solutions to change our lives. This book is a brilliant intellectual amalgamation based on a week long discussion between the Dalai Lama and leading figures from the worlds of neuroscience and psychology. The author sets out to explain destructive emotions by combining Buddhist philosophy and scientific research and discusses how we can transform these damaging human traits towards a more peaceful future. An interesting and thought provoking book on Buddhism in the West. David Brazier offers an explanation that Buddhism is not an absolute truth. The author looks at the differing approaches to Buddhism across the world, it's divisions, and it's strengths. This is a book that is well worth reading, it's message is simple; living in the now is the only true path to happiness and enlightenment. Eckhart Tolle provides an excellent manual for anyone who's ever wondered what exactly "living in the now" means. Filled with inspirational ideas and guidance about how to experience the emotions or states we call emotional pain without getting so tangled up in them.